Magnesium supplements and magnesium cures are a huge topic in homeopathic medicine, and we could spend many articles diving into every type of magnesium. But today, we’re going to concentrate on one specific type of magnesium compound that we have found is the best for pain relief. The remedy referred to as Mag Phos is beneficial for the muscles, nerves, heart, and more. A remedy is considered a cell salt when it is one of the 12 main mineral combinations that compose the human body and is found between the 3x and 12x potencies. Cell salts are prepared according to homeopathic principles, and a 6x potency means that phosphate of magnesium was diluted 1:10 with an inert substance, like water or alcohol, six times. There are a variety of mag phos 6x benefits. This preparation is easily absorbed by the body and does not require a balanced pH, adequate digestive enzymes, etc. These would only be required by the body to break down the magnesium phosphate in its original form. What Other Types of Magnesium Are Out There? There are many, many different types of magnesium available on the market, including magnesium citrate, magnesium sulfate (epsom salts), magnesium oxide, magnesium chloride, magnesium glycinate, and this just scratches the surface. There can be side effects to taking magnesium. You may want to consult a homeopathic practitioner or seek medical advice before taking any type of magnesium if you are unsure. 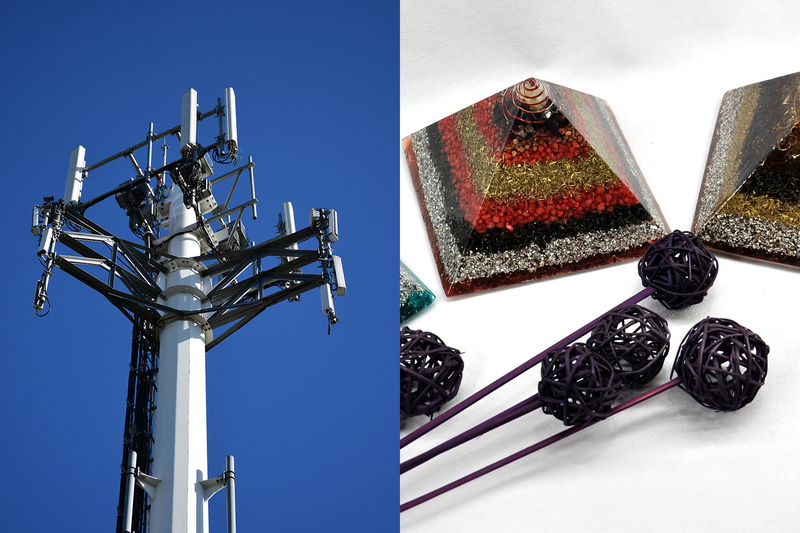 What is Mag Phos Used For? Mag phos is found to be highly effective at alleviating those pains which are quick and sharp. This can include chronic conditions like sciatica as well as menstrual cramps, muscle cramps, heartburn, various darting pains and more. Magnesium deficiency is even linked directly to certain ailments. Leg cramps magnesium deficiency is a very common ailment that can be solved by adding Mag Phos to your homeopathic regimen. Is It the Same As Magnesium Phosphorica? Magnesium Phosphate and Magnesium Phosphorica are different words for the same compound. You might also see this cell salt labeled in several other ways, including Mag Phos, Magnesium Phosphoricum and Phosphate of Magnesium. If you are looking for homeopathy for the heart, Mag Phos might just be it. Magnesium Phosphate is the best form of magnesium for heart health. This cell salt has an affinity for both the muscles and the heart. It helps with heart concerns by supporting the muscular tissue of the heart and bringing balance to its rhythmic contractions. For the reasons mentioned above, it has been found helpful for chest pains, too. This cell salt also works as a nerve stabilizer and has been found to alleviate pains associated with sciatica, neuralgias, and teething or toothaches. Pains that benefit most from Mag Phos are usually darting in nature and can feel lightning-like or electrical, especially with the speed at which they move from place to place. These pains are often made to feel worse from cold and feel better with the application of heat and pressure. Often, the pain will be preceded by a spell of weakness or a sudden, profuse sweat. Arthritis, rheumatism, joint pain, and pain in general will benefit from Mag Phos if the symptoms associated with the condition match the types of pain that Mag Phos is known to help. Namely, this refers to pains that radiate to anywhere in the body and that are improved by heat and pressure, such as rubbing the painful area or pressing into it. Other conditions we recommend magnesium for: magnesium for leg cramps at night and magnesium for cramps in feet. Its use as a muscle relaxant means that as a treatment, magnesium for menstrual cramps and menstrual pain can be highly effective. Mag Phos specifically works by relaxing the smooth muscle of the uterus, releasing tension and alleviating the pain from cramps associated with the menstrual cycle. This is also the reason why magnesium phosphate for muscle cramps is such an effective remedy. We think that Magnesium Phosphate is the best magnesium for menstrual cramps. Mental and emotional symptoms indicating a need for Mag Phos are largely ailments that result from being in pain. The person in pain may complain, be self-pitying or angry, averse to working, depressed, or changeable in their moods. Usually, this is because the pain interferes with their mental focus, and they may have given up on getting over the pain. They can also feel anxious, forgetful, and drowsy. Often, they look as if they could drift off to sleep, yet their pain keeps them awake, exhausting them more. Their fears, too, will reflect their pain: fear of moving, fear that they will not be able to move because of the pain, and fear of being paralyzed by the pain. Mag Phos is also a great remedy for headaches, especially headaches that sit above the eyes, headaches that are worse on the right side of the head, or when it feels like a cap is being pulled down tight on the head. A need for Mag Phos is also indicated by headaches that radiate to any part of the body, migraines that are accompanied by nausea or when the headache or migraine is so severe that the person vomits from the pain. Sometimes, if Mag Phos alone is not enough to help the condition, other cell salt remedies will help it in its action. Take Nat Mur along with Mag Phos for headaches. Take Calc Phos along with Mag Phos for joint pains, teething, toothaches, and arthritis. Take Kali Phos along with Mag Phos for chest pains. 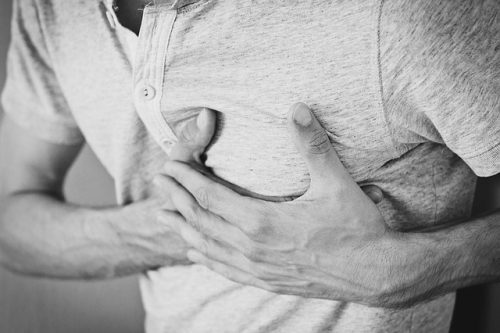 Take Nat Phos along with Mag Phos for heartburn. Because Mag Phos is the primary cell salt for pain, it can be repeated as often as needed. In cases of severe pain, it could be repeated every half hour or more. As the pain or symptoms improve, decrease the frequency with which it is taken. To address a more chronic concern, taking a dose 3 to 4 times daily is advised. And, for maintenance dosing, consider 2 doses daily. One dose of a cell salt usually consists of around 5 pellets which are placed under the tongue to dissolve. For the cell salt, use Mag Phos 6x (the cell salt potency). For relief from spasms, dissolve 2-3 pellets in warm water and take in sips throughout the day. As a heart strengthener, dissolve 1-2 pellets under the tongue four times daily. As you can see, the cell salt Mag Phos can aid in numerous health conditions, and because of this, it is known as a remarkable remedy. Some even consider it Schuessler’s greatest contribution to the homeopathic Materia Medica. Ultimately, our health comes down to how we eat, drink, feel, live and love. When we have hair loss, most of the contributing factors are a deficiency somewhere in the health of the person. Hair is an indication of the health of the nervous system, intestinal villi and more. Strong hair is a result of eating a balanced and healthy mineral rich diet. The photo to the right was created by author Michio Kushi. It indicates what organs are weak that are contributing to hair loss. 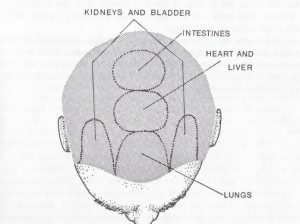 Baldness is a sign that our internal organs are becoming weak. 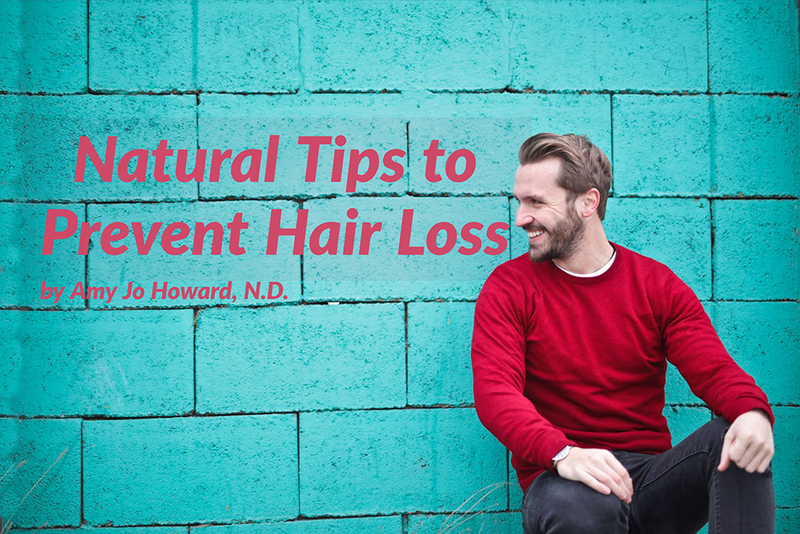 The best natural solutions for hair loss include a health diet of whole foods as well as a selection of herbal remedies and essential oils. Minerals hold and control vitamins in the body. Vitamins are useless without a foundation of minerals! All body processes are dependent on minerals. It just so happens that we are at a time in which our food supply is the most mineral deficient that it has ever been in history. Even a diet rich in fruits and vegetables is still mineral deficient compared to what it was 100 years ago. Over the last 100 years we have depleted our top soil over 80 inches. We have barely 4 inches left. This is due to ignorant and incorrect farming methods. Chemical fertilizers and pesticides have stripped the soil of necessary nutrients. Therefore, our society is now nutrient deficient as a whole and consequently the sickest it has ever been in history. In addition, many people consistently eat processed foods that are completely void of nutrients and laden with chemicals which cause further imbalance and sickness within the body. Below is a list of the most important home remedies for hair fall and regrowth, including minerals and nutrients for hair, skin and nails. Zinc deficiencies not only contribute to a growth retardation of any kind, they also significantly contribute to hair loss as well as graying hair. A large percentage of zinc is stored in the hair, skin and nails. Approximately 25 enzymes are needed in digestion that depend on the proper amount of zinc. Zinc is also imperative in the synthesis of DNA as well as dissolving cholesterol deposits! The best food sources for zinc are: Raw goat milk, high protein foods, pumpkin seeds and all unrefined and unprocessed foods. Sodium is considered “The Youth Element” according to Dr. Jensen. He also stated: “Beauty and charm are possible through proper balance of sodium, iron, potassium, silicon and chlorine in the body”. A Deficiency of Natural Sodium can be a contributing factor in hair loss. Sodium counteracts an over-acidity in the body. Sodium is necessary for all gastric secretions as well as the assimilation of nutrients through the digestive tract. Highest Sodium foods are: Apples, asparagus, beets, greens, cabbage, carrots, celery, egg yolks, coconut, peas and strawberries. Fluorine deficiency is yet another mineral that is necessary for any resistance to decay. Fluorine preserves youthfulness and acts upon tooth enamel, bones, skin, hair, nails, tendons and the iris. Natural fluorine is NOT the same as Sodium Fluoride found in toothpaste. Natural fluorine is found in foods like: avocado, Brussels sprouts, cabbage, cauliflower, cheese, dates, eggs, garlic, any raw goat dairy products, and spinach. Iodine is a metabolizer. It is necessary for the absorption of all food and minerals. But specifically, it must be present for the assimilation of Calcium, Silica, Chlorine and Fluorine, which is necessary for healthy hair, skin and nails. Partner with your Naturopath for the best Iodine supplement for you. Highest foods in Iodine are: Kelp, dulse, sea plants and fish. Sulphur affects every cell in the body, every nerve and drop of blood. Like iron and fluorine, Sulphur enhances beauty and promotes youth. Keratin contains Sulphur. Keratin is found in nails, hair, epidermis layer of the skin and the cornea of the eye. Sulphur is directly related to the building of hair, skin and nails as well as beautifies the complexion. Foods highest in Sulphur are: Kale, Horseradish, Cabbage, Brussels sprouts and cauliflower. Many hair, skin and nail problems are attributed to a Silica deficiency. When Silica is united with Sulphur it works effectively in the nourishment of hair and nails. Adequate Silica produces healthy, shiny and strong hair. Food Sources: Alfalfa, oats, barley, nuts, seeds, kelp, rice polishings and bran. One of Hypothyroidism’s main symptoms is hair loss and thinning hair. Other symptoms are fatigue, weight gain and dry skin. An iodine deficiency can cause Hypothyroidism since one of the primary uses of iodine is in the thyroid gland. Adding foods rich in natural iodine will often improve thyroid function which will aid in the balance of thyroid hormones. Iodine is essential to the production of thyroid hormones. 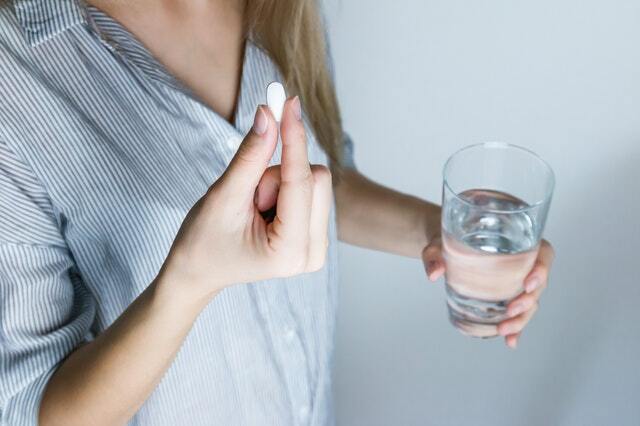 Chlorine in tap water, as well as many fluoride-based drugs like anti-depressants and anti-anxiety medications, displace the natural iodine in the body which can cause thyroid issues. 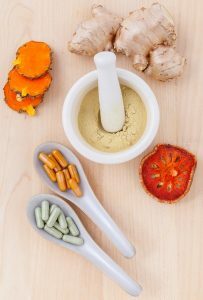 Partner with your Naturopathic Doctor for a natural thyroid supplement that will work best for you. The amino acid Arginine is essential for vital biochemical reactions in the brain and body. It is also necessary for circulation as it facilitates blood flow. A deficiency in Arginine is also a contributor to hair loss. Vitamin C which is an antioxidant that fights with the free radicals of our body, stabilizes them and prevents them from causing oxidative damage to our hair follicles and scalp. This helps in making our hair stronger and minimizes the risk of premature greying of hair and hair loss. Are There Natural Remedies for Hair Loss? Seeing a Naturopathic doctor will help you figure out the contributing factors of your hair loss or premature graying. Getting a nutrition consultation and assessment will provide you with your own protocol to follow for home remedies for hair growth and thickness, regimens to strengthen organ weakness and bring your body back into balance. Using nutritional oils to the skin such as Jojoba and Grapeseed as a carrier oil will also aid in the absorption of the oils and to help regrow hair naturally. This herb has many tonic properties. It specifically strengthens the skin and nerves. It also promotes the growth of hair. It is high in silica, zinc, magnesium, B-Vitamins, sodium and vitamin A.
Horsetail is known for being extremely high in the mineral Silica, which is necessary for skeletal strength and the growth & health of hair, skin & nails. Horsetail herb is highly bio-available when consumed and is high in iron, magnesium, potassium, silica and vitamin A.
Mulberry fruit is one of the most recognized natural remedies to reduce hair fall. It is high in carotene and vitamin A & C. This herb is nutritive and a tonic. It aids in dryness and the premature graying of hair. It rejuvenates hair follicles, promotes hair growth as well as helping to retain color. A diet rich in organic whole foods is best. All processed and refined foods must be eliminated as much as possible. Diet governs as much as 80% of our health. You are what you eat and food is medicine! But what food is good for hair growth and thickness? They key to preventing hair loss and balancing the nutrient levels in your body is to eat a diet rich in whole foods, rich in the minerals that help your body retain and process vitamins. What are your natural remedies for hair loss? Let us know in the comments! Cannabidiol (or CBD) oil is a popular treatment for many common and not-so-common conditions. It is a compound isolated from the cannabis sativa plant, and it’s been used throughout human history, contrary to what the recent hype might make you think. Unfortunately, this amazing therapeutic compound has been confused with the intoxicating compound tetrahydrocannabinol (or THC for short). Many of its most common uses, such as skin treatment and pain relief have fallen out of use because of the status of cannabis sativa as a controlled substance. As more states have deregulated control of marijuana for recreational or medical use, Americans are discovering CBD oil health benefits. Here’s what you need to know before you buy. CBD is a naturally-occurring compound found in the cannabis sativa plant. It is extracted from resin of the buds and flowers of that plant and diluted with oil to create an ingestible or topical treatment for a variety of conditions. CBD oil might also be found labeled as hemp oil, though these are more commonly made from the seeds, stems and leaves of the cannabis plant, and may only contain trace amounts of cannabidiol. The key difference between CBD and the compounds in marijuana known as THC is the “high” that THC gives. Cannabidiols contain no psychoactive properties. What they do is interact with the body’s endocannabinoid system to help the body adapt to stressors. The human body has cannabinoid receptors all throughout its digestive, reproductive and immune system, and the phyto-cannabinoid (such as CBD) help to regulate functions in these systems. While CBDs may not be a true “cure-all,” they help regulate function in all parts of the body. The 21st century isn’t the first time we’ve seen cannabinoids used for pain relief. Whew! Now, what specific CBD oil health benefits can you expect? The 21st century isn’t the first time we’ve seen cannabinoids used for pain relief. Marijuana has been used medically just as long as humans have been farming! So why is it such a buzzword now? Studies are showing that the CBD oil benefits for pain are so great that doctors have begun recommending it for their patients. With legalization of cannabis on the ballots in so many states, people are starting to research the numerous benefits the plant has for human health. The fact is, your body creates its own cannabinoids (called endocannabinoids, which are neurotransmitters) that bind to cannabinoid receptors in your body. That’s right: your body is actually built to receive different types of cannabinoids! Cannabidiols are called phytocannabinoids, and they perform the same action as the endocannabinoids produced by our bodies already, reducing pain. Studies show that CBDs can greatly reduce chronic pain by activating these neuroreceptors in your body! Taking CBD oil for pain works by activating these receptors, reducing inflammation and soreness. In the United States, over 18% of the population (no follow) is said to suffer from highly treatable anxiety disorders, and only 40% of those people are taking steps for treatment. What’s more, many pharmaceutical drugs to treat these disorders can be addictive and often have myriad negative side effects. These can range from insomnia to drowsiness and agitation. For some of the same reasons above, CBD has been shown to help symptoms of depression and anxiety in those who take it regularly. As mentioned above, a 2011 study was performed in which 24 people diagnosed with anxiety disorders were given a placebo OR 600 mg of cannabidiols orally before a public speaking test. The statistically-significant results were that those who received the CBDs experience significantly less anxiety and detriment to their performance during the test. The link between CBD and the treatment of anxiety and depression? Cannabidiols act on the brain’s receptors in similar ways to serotonin, which has been shown to elevate mood. Over 50 million Americans suffer from acne according to American Academy of Dermatology, and if can be very pesky to cure. There is emerging anecdotal evidence that CBD oil benefits for skin can include reducing inflammation and treat acne. Acne stems from different causes, and whether it is an effective cure or not might depend on what is causing yours. Acne is most often caused when hair follicles are clogged with dead skin cells, which cause whiteheads and blackheads to appear on your face, neck or shoulders. The place where your body produces the most skin oils is where acne is most likely to appear. Hormonal imbalances can cause swelling and stimulate the oil glands in your skin. This can lead to increased oil production, which can cause acne. So, what are the benefits of CBD oil for acne? As your body attempts to force out the build-up of dead skin cells inside of your open pores and hair follicles, the skin swells and reddens. Like most other systems in the human body, cannabinoid receptors exist in the skin, and when these are activated by cannabidiols (CBDs), it can greatly reduce the visible signs of swelling. CBD oils can also help to balance the symptoms that cause over-active oil glands, though scientists and health professionals are unsure of the precise link that causes this. Taking a supplement of CBD oil as acne treatment can address the root causes of acne as well as deeper skin issues such as dry skin, skin inflammation and swelling. Our store carries a selection of CBD-based skin care products for you to explore. Though anecdotal evidence exists to show how CBD oil can help with every symptom ranging from acne to chronic pain, very few cures have gone through the rigors of FDA testing and approval. In fact, in the US there is only one disorder for which CBD-based medication is an approved cure: seizures. Before CBD was approved, Keppra was the dominant cure for epilepsy. Keppra has for years been the standard treatment for patients who experience chronic seizures. It is based on a chemical called levetiracetam and is a highly effective treatment. However, many of the side effects can impair social health. Many, including various psychiatric symptoms, suicidal behavior, depression, fatigue and dermatological reactions, have caused patients to look for better alternatives. Enter CBDs. The incredible pain-reduction benefits of CBD oils make them a perfect alternative to pain medications. One of the newest and most serious treatments that CBDs are being tested for is cancer patients. The pain relief that cannabidiols provide, applied topically or taken orally, can seriously help relieve the symptoms of cancer and treatment. To be clear, there is no current connection being made between CBDs and cancer treatment. However, cancer and cancer treatments both are extremely damaging to the body. Because of this, patients can experience many aches, pains and symptoms that can be mitigated while they go through various treatments. Cannabidiols can help relax the body and help with pain management associated with chemotherapy. This is thought to be related to cannabidiols’ anti-inflammatory properties, in which it reduces inflammation to alleviate soreness as well as the ways in which it interacts with cannabinoid receptors in the body. CBDs have been found to relieve the aches and pains associated with chemotherapy, as well as treatment-induced nausea and vomiting. Cannabidiols are well-known for acting on a variety of neurological pathways in the body, helping to regulate the body by activating cannabinoid receptors throughout the body. Imagine what else research into CBDs will uncover! Visit our shop to learn more about the CBD oils and topical creams we carry from Hale, Miracle Balance and Uttati. Our staff stays abreast of the latest research in our industry and is available to answer your questions! But if you’re unsure of how it might interact with your current medications, consult your doctor. If you have any experience with CBD oils, leave a comment below! We’d love to hear your story. There’s a lot of great buzz going on about the ketogenic diet, being in a state of ketosis, or being keto adapted. A year ago, I didn’t know much about ketones, but I can say in the past 12 months I’ve immersed myself with most things keto and what a great experience it’s been!! For instance, I’ve been learning about how to change my diet to a more ketogenic one and how to get my body into a state of ketosis from exogenous ketones. This is the first in a series of blogs that explains what ketosis is and why it’s so important for natural health. My hope is to pass on the knowledge I’ve gained about ketosis to benefit as many people as possible. First off what does it mean to be in a state of ketosis or keto adapted? Basically, this means the body burns fat, not sugar, for fuel. Though that sounds easy enough, those who have tried know how hard getting into a state of ketosis actually is. For starters, we live in a sugar and carbohydrate world. Though sugar and carbs taste great, they are not contributing to our health and are doing us a lot of harm. Our ancestors naturally went into and out of ketosis because of their diets. Today, we have to be very specific about our food choices to accomplish this. 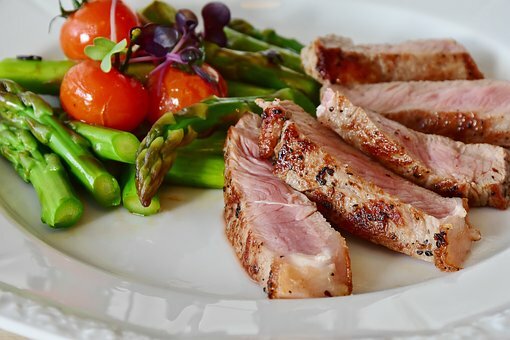 Dr. R. M. Wilder, in 1921, developed the ketogenic diet at the Mayo Clinic in Minnesota to treat patients with seizures and it was nearly forgotten for over 70 years. Fortunately, it is making a comeback and many people are converting from the standard American diet (SAD) loaded with sugar and carbohydrates to a more ketogenic diet that is based on high-healthy, fat, moderate protein and low-carb foods. NITE Light is back for the summer&excl; NITE Light is the quarterly newsletter for NITE, the Naturopathic Community Center (NCC) and Herbs etc. Not only do our newsletters give you tried-and-true information on how to have a healthier life, it will keep you updated on current natural health news going on in the world and within NITE, Herbs etc, and the NCC. Summer is here, the flowers have bloomed, and it’s time to start spending time outside again. Even though the sun has healing properties, the outdoors can still pose health risks. Read our newsletter to find out latest summer health remedies and class happenings so you can strengthen your natural health knowledge. We here at NITE, NCC and Herbs etc. want to thank our students, faculty, alumni, guests and customers for the support they give us. Without your support, we wouldn’t be able to provide exceptional naturopathic education, services, and products that optimize and supplement the body’s health. We only get one body in our lifetime, so it’s worth it to take care of it and ensure it’s functioning the way we need it to. You can download NITE Light: Summer 2018 Quarterly Newsletter below. 70%-80% of your immune response occurs in your gut and it’s where the majority of your immune cells go to fight off germs when you’re sick. Unfortunately, today it’s tough to keep probiotic levels in your gut stable. Antibiotics, illness, artificial sugar, and pesticides can kill off those friendly gut bacteria and let killer germs like C. difficile take up residence, leading to a common illness called ‘antibiotic-associated diarrhea’ (AAD). That’s why it’s important to supply probiotics into your intestines. By definition, a probiotic stimulates the growth of microorganisms with beneficial properties. Not all probiotics are limited exclusively to dairy products, like yogurt. Many strains are naturally occurring in the human body, but a shortage of probiotics can lead to several adverse effects for both your body and mind. Having these live microorganisms can boost immune system health, support heart health, encourage a balanced mood, and more just by residing and reproducing in your gastrointestinal tract. By adhering to the walls of your intestinal tract, probiotics helps prevent harmful bacteria from replicating and flooding your system in a process known as “competitive exclusion.” They can even help fight side effects of repeated antibiotic treatment. So how do probiotics work to yield health benefits? Probiotics produce essential nutrients like vitamin B3 and folate. Bad bacteria, like E. coli and C. difficile, produce toxins that poison, cause illness, and speed the aging process. When friendly probiotics like Bifidobacterium infantis line your intestines, they break down fiber and sugars that lead to bloating, gas, and aggravate conditions like IBS. And studies have shown that men and women with balanced levels of probiotic bacteria can focus and concentrate better and enjoy stronger bones, normal blood sugar, fewer allergies, and better cardiovascular health. Your life depends on the health of your gut. When you don’t have enough probiotic bacteria, germs and toxins attack the lining of the intestine. This damages the cells lining your intestine, and with enough damage, germs and toxins get into your blood. While you may not see this happening, you feel the results. Frequent bloating and gas indicate there’s a problem with your digestive system, and probably indicates your intestines are running low in beneficial bacteria. But you may also experience frequent headaches, increased allergic response, blood sugar spikes, and chronic illness. The benefits of probiotics are many and this probiotic product, Nature’s Sunshine Probiotic Eleven, contains the following strains of good bacteria. These probiotic strains have a large range of health benefits which can ease certain symptoms and improve overall health for both men and women. Studies involving the Lactobacillus strain of bacteria suggest supplementation could lessen feelings of anxiety or ease symptoms of depression. Combining these probiotics with prebiotics also show significant benefits in mood health. Additionally, L. rhamnosus might be one of the best probiotics for weight loss. One study suggests taking L. rhamnosus might counteract weight gain and diabetes, and there’s a lot of research examining the benefits as a treatment for gastrointestinal issues like irritable bowel syndrome. Another study suggests a link between good bacteria and seasonal allergies, particularly with hay fever. If you’re looking for something to strengthen your overall immune function, L. rhamnosus could help there. A promising study suggests this strain could be just as helpful as an antibiotic for treating urinary tract infections. High levels of Bifidobacterium bifidum in your gut break down fiber, coat the inner lining of your intestines, and even stimulate your immune system. When you were born, the probiotic B. bifidum strain was already present in your intestines, protecting you from germs. In fact, it made up nearly 95% of your intestinal bacteria! B. bifidum attaches to your intestinal lining and helps digest sugar and protect the physical lining of your intestine against damage from toxins or germs. This keeps toxins and germs out of your blood and prevents them from making you sick or disrupting cellular function while it stimulates your immune system. On top of all this, probiotics like B. bifidum also produce important vitamins like B12, biotin, and K2 Recent research even shows that B. bifidum reduces the incidence of cold and flu. Antibiotic use drastically decreases B. bifidum population, as does every day environmental factors. But with so many environmental toxins like pesticides and foods loaded with artificial sugars, adults and children alike need a supplement to maintain the best possible health. One of the best strains of probiotics out there is Lactobacillus Acidophilus. Much like Lactobacillus Brevis, this strain of probiotic occurs naturally within the body. Not only does it promote digestive tract and immune system health, it also helps in the production of lactase. It helps to maintain a healthy balance of bacteria in your digestive tract by producing vitamin K, lactase, acidolphilin, acidolin, bacteriocin, and lactocidin. In doing so, Lactobacillus acidophilus helps your body naturally break down lactose into simple sugars. This could provide some benefit to those with lactose intolerance. It even modulates immune system function. Some research even suggests it may provide some help with urinary tract infections, irritable bowel syndrome, and bacteria deficiencies caused by antibiotics as well as providing some benefit for cardiovascular health by reducing cholesterol. One of the best probiotics for your body is Lactobacillus brevis. Discovered as far back as 1921 by E.B. Fred, W.H. Peterson, and J.A. Anderson, this wonderful bacterium occurs naturally in the human body and is even present in breast milk. L. brevis is also found in high amounts in fermented foods like sauerkraut and pickles, and it’s abundant in nature; however, it’s only present in low amounts in the body due to environmental factors, poor food choices, and overall lifestyle habits. Like most probiotic bacteria, L. brevis may be helpful for supporting digestive health, and some research indicates its ability to combat ulcers. As no surprise, Lactobacillus brevis helps boost your immune system by increasing natural killer cells. It also has anti-microbial facets, can help the health and condition of the gums, and boost the effectiveness of antibiotics. L. bulgaricus is a probiotic that lives in the intestinal mucosa, the mucous membrane that lines the gastrointestinal tract. L. bulgaricus is hardly enough to be able to withstand the acidic digestive juices secreted by the stomach. The organism grows when it’s needed and diminishes when it’s not. L. bulgaricus is called a symbiotic bacterium; it lives in harmony with the other helpful bacteria that normally live in your gastrointestinal tract. Here the micro-organism helps neutralize toxins and kill harmful bacteria by producing its own natural antibiotics. The probiotic L. plantarum works to maintain a balance of good and bad bacteria and does so while helping out with digestion and optimizing levels of vitamins and minerals. In fact, L. plantarum can actually synthesize some nutrients, like L-lysine. Animal models show Lactobacillus plantarum may be helpful in reducing bacterial translocation, a benefit dependent on bacterial adhesion to the intestinal wall. Antibiotics are becoming an increasingly common contributor to hospital-acquired infections, and research shows Lactobacillus plantarum may be of help. Because antibiotics deplete natural gut flora, it opens the way for spore-forming bacteria to infect and proliferate. One study has shown probiotic supplementation with L. plantarum may reduce the incidence of Clostridium difficile-associated disease in hospitalized patients following antibiotic administration. In addition to this benefit, L. plantarum may also reduce gastrointestinal side effects commonly associated with antibiotics. Still, others note many of the same benefits as with Lactobacillus probiotics: decreased colorectal cancer risk is a big one. Is a probiotic used to create lactic acid, so you can find it in fermented products like yogurt. And because it breaks down lactose into acid, it’s also often prescribed to lactose-intolerant individuals (to make it easier to digest dairy.) But it doesn’t stop there! Not only can it boost a person’s immune system, but it can also help with colon health, possibly even lowering the risk for colon cancer. There is some research that S. thermophilus may be helpful during chemotherapy by protecting the intestinal tissues from irritation caused by chemotherapy drugs. Another study shows S. thermophilus correlates with better growth in children. Antibiotic-associated diarrhea (AAD) is a growing issue today, and people are seeking natural methods for relief. Since antibiotics kill good bacteria and sometimes allow harmful bacteria to grow, diarrhea is often a result. Certain probiotic strains of S. thermophilus have been shown to reduce AAD. B. infantis thrives most in the intestines of infants as it helps break down lactic acid in human breast milk. With this benefit, isn’t it fitting that the bacterial strain is named B. infantis? But don’t let its name fool you; it’s good for kids and adults, too. This probiotic also feeds on natural fructose (not the Frankenfood ingredient HFCS), glucose, and other all-natural carbs. Adults who keep their B. infantis levels in balance enjoy better overall health, an active metabolism, and less discomfort after eating. British researchers reported it only took four weeks for women who took B. infantis to enjoy a significant improvement in their IBS symptoms. Another study published in the American Journal of Gastroenterology found B. infantis supports stomach health and digestion. It also supports your immune system against unwanted bacterial growth in the intestines, and some strains even produce B vitamins. Similar to other bacteria in this family, Bifidobacterium longum boasts an impressive list of benefits to the human body. Bifidobacterium longum can help reduce gastrointestinal discomfort caused by stress. In addition to this benefit, B. longum may also attenuate anxiety and possibly reduce the risk for colon cancer. The best feature of this particular probiotic is its ability to soothe irritation in the body. Much like many of the strain’s brothers and sisters, B. longum can be found in fermented foods and some probiotic supplements. Supports digestion, the immune system, and soothes the bowels. It has been shown to improve bowel regularity, so may be useful for constipation.